What If Baseball's Foul Lines Ran On Forever? In W.P. Kinsella's novel, The Iowa Baseball Confederacy, the narrator's father muses upon a loophole in the rulebook. There's nothing that specifically states the foul lines end at the fence. "And the field runs to infinity," he would shout, gesturing wildly. "You ever think of that, Gid? There's no limit to how far a man might possibly hit a ball, and there's no limit to how far a fleet outfielder might run to retrieve it. The foul lines run on forever, forever diverging. There's no place in America that's not part of a major-league ballfield: the meanest ghetto, the highest point of land, the Great Lakes, the Colorado River. Hell, there's no place in the world that's not part of a baseball field." It's not strictly true, since what matters is where fly balls are relative to the foul pole when they cross the fence. Speaking of "fair" or "foul" territory 500 feet from home plate is as meaningless as speaking of time before the Big Bang, when there wasn't yet such a thing as "time." But it's fun to wonder. 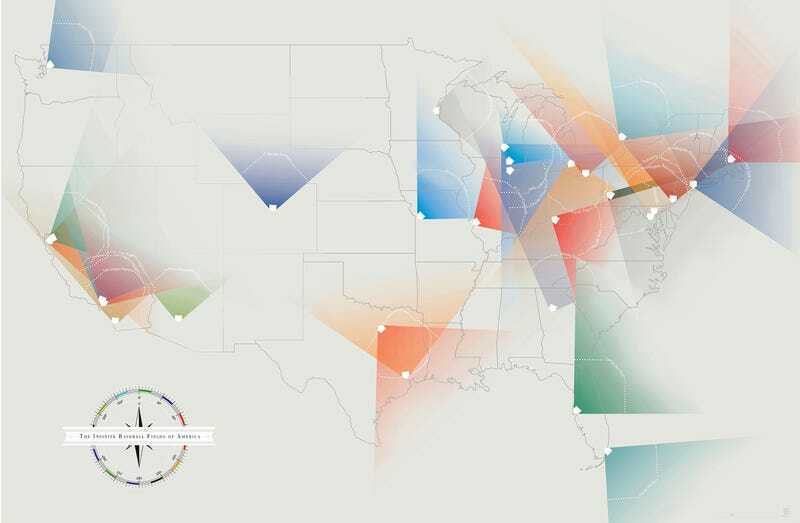 To that end, Pop Chart Lab has created "The Infinite Baseball Fields of America," a poster illustrating the foul lines of every major league ballpark, if not to eternity, then at least for a few hundred miles. The first thing that jumps out is that every field points east, or north. It's not a coincidence. It's to avoid, in those early summer games, the setting sun being directly in the batter's eye. Also, the majority of urban stadiums that sit in the middle of a city's grid system—Target Field, Yankee Stadium, AT&T Park, etc.— tend to line up with the grid, pointing in a cardinal direction. Click the map to expand. Notice any other patterns?